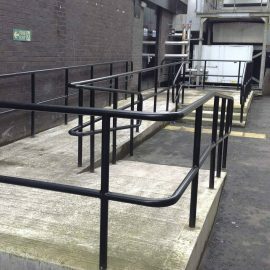 Abbey Gates supplies high quality, custom made safety handrails and guardrails for all areas in, and surrounding Glasgow, Greenock and Ayrshire, Scotland. 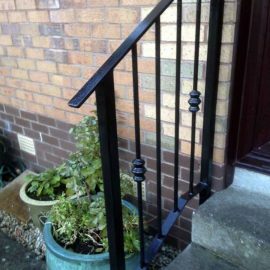 Whether you require safety hand-rails to be attached to steps or placed around certain areas of your garden, we can provide you with a stylish safety handrail. The high demand for safety handrails & guardrails is due to Scotland’s reputation for bad weather, which can be anything from high-winds, rain or snow. Why choose safety handrails & guardrails from Abbey gates? 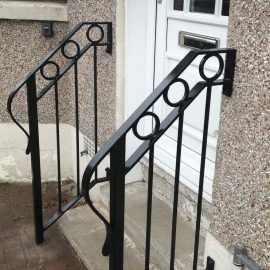 Our handrails can be produced in a variety of designs and finishes, allowing them to look “at home”, anywhere from your front door to your garden path. For safety handrails and guardrails at a work premises, as a general rule, any unprotected edge of a walkway platform, staircase or other raised area from which a person may fall more than 0.5 metres, must be fitted with a guardrail. Abbey Metal’s handrails & guardrails are designed to provide safety and give assurance for users of staircases and walkways. We supply handrails not only to complement our staircases, platform and other similar structures.